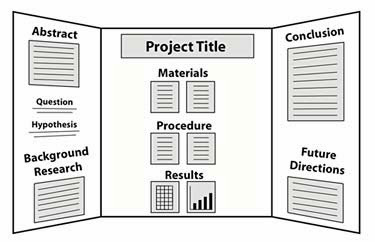 This is the layout for the science fair presentation board we will discuss in detail in class on Wednesday, focusing on how to make the material stand out and look professional. Quality workmanship is critical. Crooked papers, smeared glue, etc will give the wrong first impression. Break out those rulers and line things up. Take your time and make it look good!